How does your pantry make you feel? I have worked in a lot of pantries lately. I’ve seen the overwhelm of shelves overstuffed with out of date food that has been untouched for years. I’ve seen the frustration of a client that can’t find what they want and the remorse of wasted food. But a pantry does not need to make you feel like this. 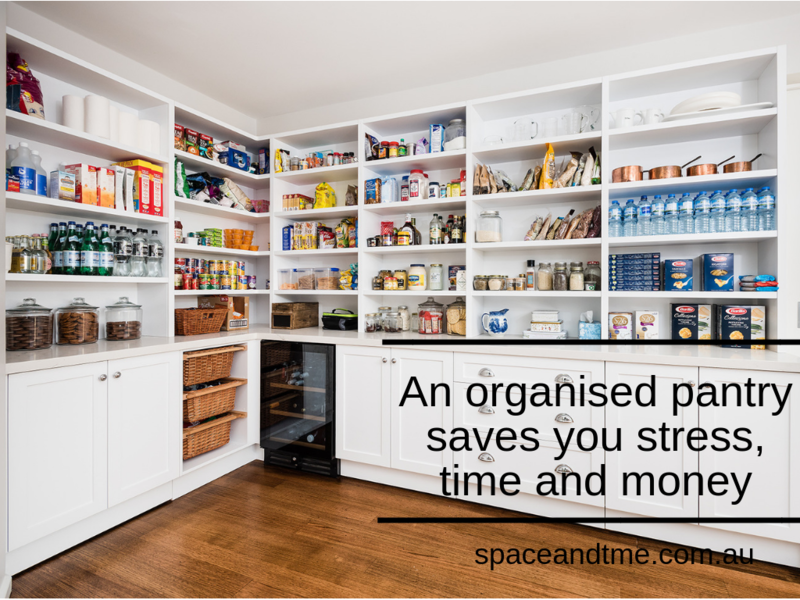 With a bit of time and by following my Space and Time Organising S.Y.S.T.E.M you can create an organised pantry that saves you stress, time and money. At some point the frustration and overwhelm of an unorganised pantry gets too much and I receive a call asking for help. I helped a mother and daughter move house recently so of course they needed to clear everything out and box up the things that they wanted to take with them. Some of their food was out of date so it went to the compost and recycling, other was still in date, but they no longer wanted it so we donated it to a local charity. Another client had moths (and they were going away for an extended period of time). We took everything out of the pantry and wiped all containers to remove traces of moth eggs and discarded moth riddled food. I also worked with a Mum with 3 small kids. All the food was in date, we worked together to sort into like categories, put them into IKEA tubs and labeled them. One of the first things I do with each pantry is sort items into like categories, discarding items that are out of date or that they’re just not going to use. Each category is then given a permanent home in the pantry depending on the frequency of use. Frequently used items on the shelves close to the entryway and on the shelves between shoulder and knee. Less frequently used items on lower or higher shelves. A permanent home can be created by using labels, or baskets, or containers. A permanent home makes it easy to find ingredients when you’re in the middle of creating dinner at the end of a long day. Remember to always return things to where you got them from! saves you money because your not buying items again. saves you time by allowing you to quickly and easily create a shopping list whilst you browse your shelves and know what’s missing. saves you stress by putting all your frequently used items at your fingertips. All of the above clients felt such relief when the pantry had been sorted. “I was so glad I picked up the phone to Julie to get help. With 3 children under 4 I just couldn’t get the job done on my own. I recommend her services, they’re worth every cent”. Go ahead and try one shelf at a time or set yourself a timer and go through the items in your pantry. There’s a full description of overhauling a pantry using the Space and Time Organising S.Y.S.T.E.M. here. Or invite me over for a cup of tea and to roll up my sleeves to get the job done and in a few hours we can declutter, sort and organise your whole pantry so you too can save stress, time and money. Reach out to me via info@spaceandtime.com.au or you can book me here.